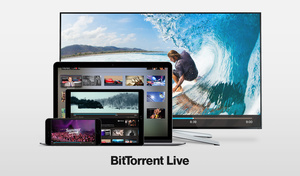 BitTorrent has launched a new live video streaming platform, available via TV, mobile and desktop apps. The service, dubbed "Live," runs on P2P tech (duh) and will livestream sporting matches, news, music concerts and other interesting content. BT says the app is free to download and will come with free programming channels but there will be ad-supported and paid channels in the future. AWE: Formerly known as WealthTV, AWE is a 24/7 network devoted to taking viewers on a journey of how wealth is achieved, used and enjoyed. Clubbing TV: The official media partner of some of the planet's biggest electro festivals, Clubbing TV offers exclusive, quality electronic music content from artists and labels all around the globe embracing the entire the Dance Music lifestyle. FAST&FUN is a new Television Channel offering an action-packed, adrenaline-including medley of extreme sports, from car racing and motocross to snowboarding and skateboarding; a large variety of disciplines, shows and competitions from all over the world. Fightbox: From MMA and boxing to arm wrestling and sumo, Fightbox is a compilation of the finest combat sports from around the globe all on one channel. Heroes TV: Delivers what action, adventure fanatics want. Heroes TV targets audiences with Multiple programming categories to offer the most comprehensive action, adventure line up on TV. NUsicTV: Delivers the finest new independent artists at the forefront of music in a linear broadcast, allowing viewers to discover the vanguard in music without having to search the internet. OANN: Features political analysis programming and political talk shows, along with network special documentary-style reports; its news coverage attempts to maintain objectivity while its political shows illustrate a stronger conservative lean. One World Sports: It features exclusive, live, world-class sporting events and premier matchups from around the world, with over 3,000 hours of unduplicated sports programming annually. Content focus is on live and same-day action of league, championship and qualification competitions in soccer, basketball, baseball, golf, table tennis, badminton, darts, and more. OpenNews TV: OpenNews TV brings you live video talk shows from the best progressive talk radio personalities. Pursuit Channel: Pursuit Channel is a television network that airs programming geared to hunting, fishing, and outdoor recreation. TWiT: The TWiT.tv Netcast Network with Leo Laporte features the #1 ranked technology podcast This Week in Tech, along with over 20 other top-ranked online shows. This kinda crap on TV serves one purpose.....to give people an excuse to stay glued to the boobtube! Tantamount to TED tv......it's crap content and a lame excuse for people to hear themselves talk...to others. Anybody watching this garbage regularly needs to go fly a kite and get a girlfriend. Live stream is great only when the mayor TV network's are restraining by govts or big bosses to show the real news: LIVE. All independent news networks use live streaming.